Nikki Sixx is reminiscing about his farewell to the band that has been central to his life for the last 35 years. It was the early hours of January 1, 2016, and the location was the Staples Center in downtown Los Angeles. The occasion was Motley Crue’s last-ever show – something Sixx and his bandmates had carved in stone, or at least signed a legally binding contract to say as much. As any famously respectable, law-abiding band would. In Sixx’s head, the final notes have faded, the last pyro has cracked into the sky. Thank you and good night. 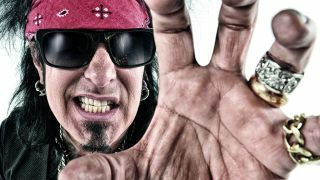 “So I get off stage at the last show with Mötley at one am,” drawls the bassist, looking remarkably well given past excesses (only the line of white hairs clawing at his dyed black goatee give any clue to the fact that he’s 57), “and I fly off to Mexico with my wife the next morning at 7am. We have two weeks down there, really great, arrive back home and wife’s mom’s there – she’s been watching our dogs. I get in, refreshed, feeling great, ready for the new year. If Sixx is feeling any regrets at bidding farewell to his old band, he’s very good at hiding them. Instead, when we meet him in a North London photography studio, he’s larking about on a trolley with his bandmates in Sixx:A.M., guitarist DJ Ashba and singer James Michael. He’s fairly bouncing with enthusiasm at being able to focus fully, for the first time, on a new project. Well, we say ‘new’, but Sixx:A.M. is now nearly 10 years old. The difference now is, as they prepare to release their fourth and fifth albums, nothing is in their way. Mötley who? That future looks far rosier than it has any right to be for a man pushing 60, who has died at least once already. This year has seen two new albums from Sixx:A.M., Prayers For The Damned Vol.1 in the spring, and its follow-up, Prayers For The Blessed, Vol.2, out now. Sixx talks about how they plan to “roll up our sleeves and make this band blow up”. DJ Ashba goes further. “My goal is to make this band bigger than Mötley Crüe and GN’R,” says the guitarist. Deluded? Quite possibly, but few bands ever got very far by aiming to headline their local working men’s club. Both albums certainly walk the walk, mixing the arena-ready sensibility of classic Crüe with a contemporary-sounding 21st century approach. Sure, they may look like a trio of grizzled ex-cons shortly after burrowing out of the penitentiary through a tunnel full of ink, but in the 21st century, rock’n’roll need no longer be a young man’s game. More importantly for those involved, they can finally use the ‘b’ word with a clear conscience. That ‘not a band’ philosophy was partly born of necessity. The Heroin Diaries was created by Sixx as a soundtrack to his autobiography of the same name, though the bassist was still very much a member of Mötley Crüe at the time. It would be another four years before Sixx:A.M. released the follow-up, This Is Gonna Hurt, by which time Ashba was a paid-up member of Guns N’ Roses (a third album, Modern Vintage, followed in 2014). He’s keen to stress the fact that this has far outgrown a Mötley Crüe spin-off project, repeating the words “it’s a completely different band” several times during our conversation. Did he feel a twinge of responsibility to give Crüe fans more of where that came from? In hindsight, it’s tempting to see Sixx:A.M. as Sixx’s exit strategy from Crüe. Not so much a retirement plan as a growing-old-disgracefully plan. As it turned out, the timing was fortuitous. Ashba exited Guns amicably last year, leaving the path clear for him to devote himself to Sixx:A.M. Today, he’s the very soul of diplomacy when it comes to his former employer. So farewell, then, Mötley Crüe, and hello Sixx:A.M. Time will tell if the latter can escape the shadow of their founder’s old band, but now that Sixx is playing the music he feels reflects him more closely as an artist, how does he see Mötley’s legacy? Does he hear their influence in new music around now? And how does he feel today about being the godfather of hair metal? Stitch that, Pretty Boy Floyd. In further proof that Sixx isn’t content to ride on Crüe’s fraying coattails anymore, he devotes much of his energy into Sixx Sense, the syndicated radio show he’s fronted since 2008, building it into one of the most influential outlets for new music out there. And at this point, Ashba climbs up on the window outside the room where we’re talking and rubs his crotch against the glass, interrupting the highfalutin philosophising. Mötley Crüe may be dead, but normal service has been resumed.